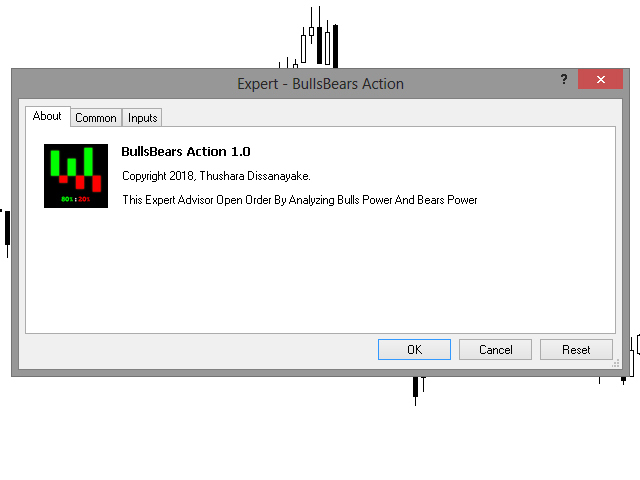 The BullsBears Action Expert Advisor is designed to open Buy and Sell orders by analyzing Bulls and Bears volume data. 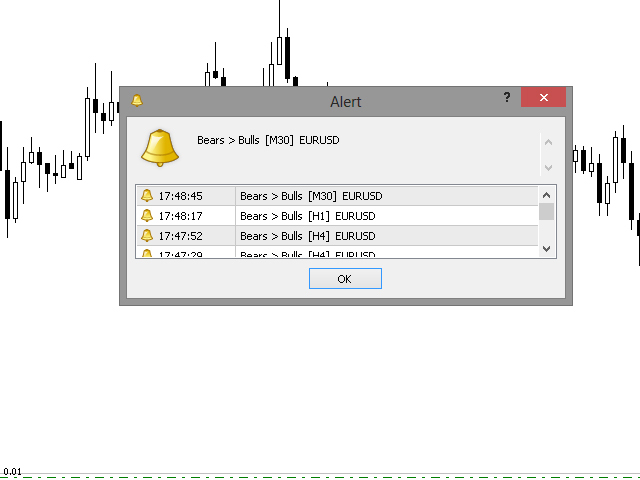 It is a very useful tool that uses volume data for trading. Bulls and Bears percentage is calculated based on candle volume data. You can simply define a value (Power Percentage) for opening orders. Then the EA automatically opens BUY order! Then the EA automatically opens SELL order! The Candle Power Pro indicator has been developed to analyze more volume data. This EA simply analyzes the current candle and open trades. 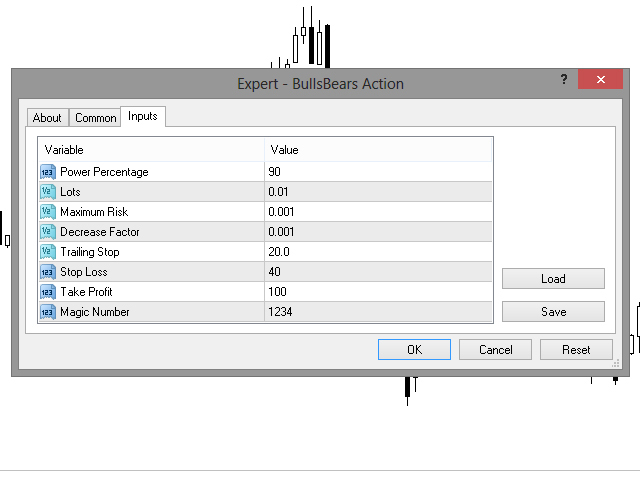 So you can improve your strategy using the Candle Power Pro indicator and automate your decision by the BullsBears Action EA. You can find more information about volume data strategies by following to the Candle Power Pro indicator page. Signals can be filtered by Moving Average Crossover, CCI, RSI and Stochastic filters. Decrease Factor - Decrease from total margin if you lose a trade. Magic Number - Number for each symbol window that you run the EA simultaneously. Power Percentage - Bulls/ Bears volume percentage for open order. Activate - Activate/Deactivate Crossover Signal Filter Option. Fast Period - Averaging period for calculation. Shift - MA shift. Indicators line offset relate to the chart by timeframe. Slow Period - Averaging period for calculation. Overbought Level - RSI level for open sell order. Oversold Level - RSI level for open buy order. Overbought Level - Stochastic level for open sell order. Oversold Level - Stochastic level for open buy order. Если оптимизировать то не плохо. Автору спасибо! So far this is proving to be a very useful tool. The main thing I like about this EA is that it will place a trade immediately after placing it to a chart and open one again as soon as it closes so this is for traders who prefer fast paced trading. But because of this to get good results you will need to choose the correct time to begin and end your trading week so that you start and end of the right side of trends. I would also advise stopping the EA Thursday night or Friday morning and manually setting SL and TP so that you can have all trades closed ready for a new trading week. I found that the default settings will not really make you money and you will have quite a high drawdown. So play around with this to get it right for your trading style. Once I had the settings right I made 20% equity gain on my account in just 2 days. Very powerful tool when used correctly and carefully. 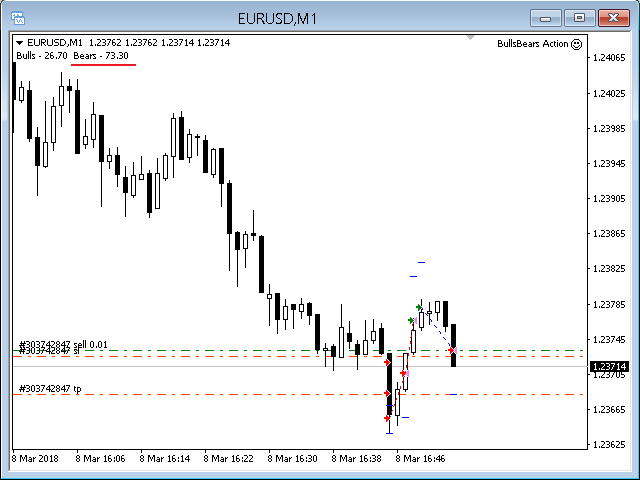 Stop loss -40 pips often reached! Best Ea in the mql5 markets! It trades intelligently and its free! Added option for Lot size management. Now you can easily use fixed lot size disabling Lot Management option. 1. Added new parameter for order closing and trailing process. 1. Added Crossover, CCI, RSI and Stochastic filters.